So walk tall, or baby don't walk at all. I'm a young man and I talk real loud, yeah, baby walk real proud for you. So long, sometimes you just gotta walk on. He's singin', singin', singin', singin'. All dressed up in satin, walkin' past the alley. Watch out for your junk man. 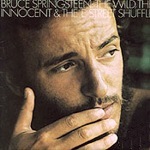 At 10 minutes this is the longest officially released studio recording by Bruce. It evolved from two other songs called "Vibes Man" and "New York Song" performed live in 1972 and 1973. "New York City Serenade" has been performed live a total of 67 times.